Question: I need to understand the OEM new feature for the AWR warehouse. 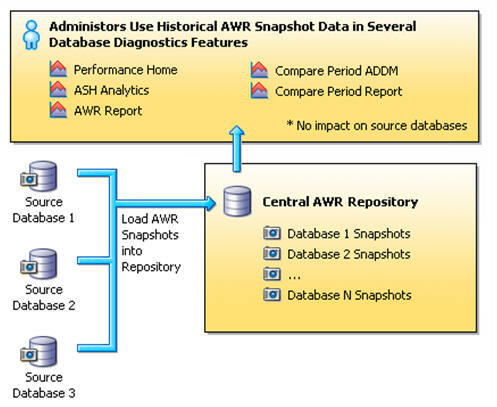 How does this AWR warehouse GUI out-perform manual AWR warehouse methods? 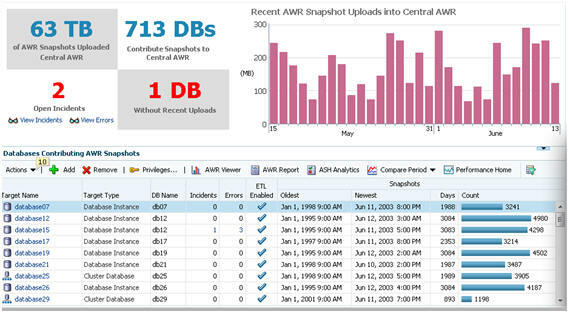 The OEM console for the AWR warehouse allows you to manage data from many databases. Now that we see the architecture and concepts behind the AWR warehouse, let's look at the foundation of the AWR data for modeling and decision support activities. The metric baselines introduced in Enterprise Manager 10gR2 statistically characterize specific system metrics over time periods matched to system usage patterns. These statistical profiles of expected metric behavior are used to implement adaptive alert thresholds that can signal administrators when statistically unusual metric events occur. Assuming that systems are normally stable and performance problems rare, it is reasonable to expect that actual performance events will be highly correlated with observed unusual values in some metric or other. Thus it is hoped that baseline-driven adaptive thresholds will both reduce configuration overhead for administrators and more reliably signal real problems than fixed alert thresholds. The idea is simple. Because Automated Workload Repository (AWR, or STATSPACK in 8i and ) keeps a historical performance record, Oracle now knows when a scheduled task is going to cause a resource shortage, before it happens! Automatically morph the Oracle instance to anticipate a daily of weekly batch job. The most common example of this is a database that runs in OLTP mode during the day (first_rows) and switches to decision support at night (all_rows). The baseline period can be divided into sub-intervals of time over which statistical aggregates are computed. These subintervals, or time partitions are intended to allow baselines to capture and adapt thresholds to expected time-dependent workload variations. Time partitioning is fully specified in EM 10gR2 by selecting both daily and weekly partitioning options. For example, consider an operational system serving many online users working similar daily schedules and running batch jobs in the evening. In this exciting paper we see that Oracle is planning to adopt the same kind of predictive model that I have espoused for many years. The basic idea is that historical data will provide valid predictive information that can be used by Oracle to fix a resource issue BEFORE it cripples your performance. Predictive modeling is widely used in the credit card industry: , and the same principles are being used by the AWR warehouse to predict trends within Oracle system performance. Setting an appropriate retention interval for your AWR warehouse is critical for proper data retention, especially for predictive modeling. You can adjust the AWR retention period according to your analysis needs. Beware that you may want to selectively truncate AWR tables while leaving the "major" statistics for long-term trend analysis. These periodic truncates are for the SQL tables, so I disable AWR data purging and manually truncate tables such as the dba_hist_sqlstat tables. See how to periodically truncate the SQL tables from AWR. In this example the retention period is specified as 3 years (1,576,800 minutes) and the interval between each snapshot is 60 minutes. Also see my related notes on dba_hist_wr_control. See these notes on setting a retention period for an AWR warehouse.